The extinct Jamaican Green-and-yellow Macaws (Ara erythrocephala) - formerly occurred in the mountains (presumably forests) of Trelawny and St Anne's parishes on the island of Jamaica in the Caribbean Sea. These macaws is believed to have been hunted to extinction in the early 19th century - probably because of hunting (BirdLife International 2004). . This species was described by Gosse in 1847 based on a bird "procured by Mr. White, the proprietor of the Oxford Estate" (Rothschild 1905). The head was right and the body green. The blue-tipped tail was red in the middle and green on top. The lower half of the wings were blue. Both the tail and the wings were orange-yellow underneath. (Rothschild, 1905; Salvadori, 1906a; Greenway, 1958). They were close relatives of the Cuban Macaws (Ara tricolor) and the Dominican Macaws(Ara atwoodi). 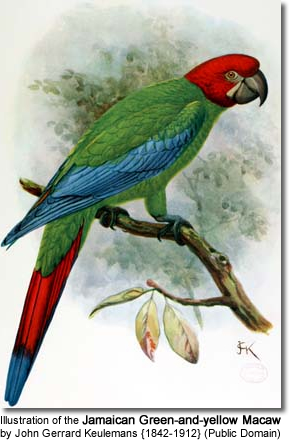 Since this macaw is only known from Gosse's notes - no skins, bones or any archaeological remains are known to be in existence - this species is considered a hypothetical extinct parrot species.